Last time I accused Bills of being a two trick pony. Great scrambles, great hotcakes, and not much else. I stand corrected. I am upgrading this particular pony to three, and possibly four tricks. The corn fritters are also very good (although not as good as Replete), and it looks like the bircher muesli deserves high praise too. But that's it. Bad luck if you want something exotic, like, hmmm... poached eggs. Sorry, we don't do those. This morning's brekky was made all the more exciting by the presence of Agent Smith, right across the communal table from us. Yes, Bill's lived up to its star-spotting credentials, and I am now able to say that I had breakfast with Hugo Weaving (we shared a table, after all). I kept hoping Trinity would join us, but the damned agent scared her off. If you're planning to take a dip in the Bondi surf, make sure you do it before having brekky at Blue Orange, 49 Hall Street, Bondi Beach, Tel +61 2 9300 9885. There was no way I was dragging my bloated body onto the beach after such a huge plate of eggs, bacon, snags, mushies and corn bread. The whale rescue team would've been rolling me back to deeper water within minutes. This place is like a strange blend of beach bungalow and ski lodge, but it works. Pine panelled walls, low corky ceiling, comfy banquettes and windows that open onto the busy Bondi street. Very cool. But it's the food that really won me over. 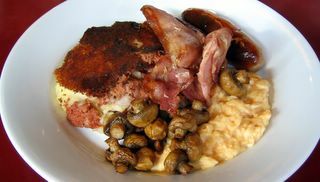 Tasty scrambles, delicious bacon, two beef bangers, juicy garlic roasted mushrooms and a magnificent slice of home-made corn bread. 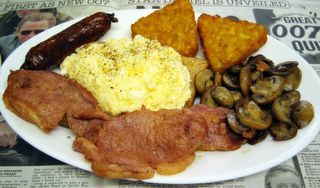 Throw in great Lavazza coffee, HP sauce and quick service and you're in brekky heaven. No weak links. After the disappointment of Spring, I decided to indulge in second breakfast at Darlinghurst's own little slice of Paris, Le Petit Creme, 118 Darlinghurst Road, Tel +61 2 9361 4738. I'm happy to report that they do a very fine Croque Monsieur, oozing with a tasty filling of melted gruyere. Tres bon. 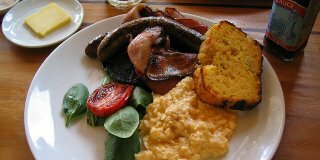 Today, in the first of a frenzy of Sydney breakfasts, I dodged my way through the Kings Cross freak-show to a place called Spring Espresso, 65 Macleay Street, Potts Point, Tel +61 2 9331 0190. Apparently Wallpaper* once rated this place as Sydney's best breakfast spot, and first impressions (menu and venue) were good. Unfortunately, the food was shite. Steer clear of the baked egg pot at all costs. 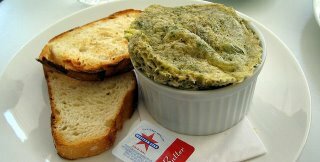 It sounded good... baked eggs with pesto, tomato and fetta. But when it arrived, the pesto egg mix was dry and bland, the tomato lacked flavour, and I had as much chance of finding a stockpile of WMD as finding a bit of fetta. They had even sliced the rubbery top off someone else's egg pot and perched it on mine, in an effort to hide the fact that mine had failed to rise. The good news is that Spring serves Cremcaffe, and it is without doubt the best coffee I've ever had. 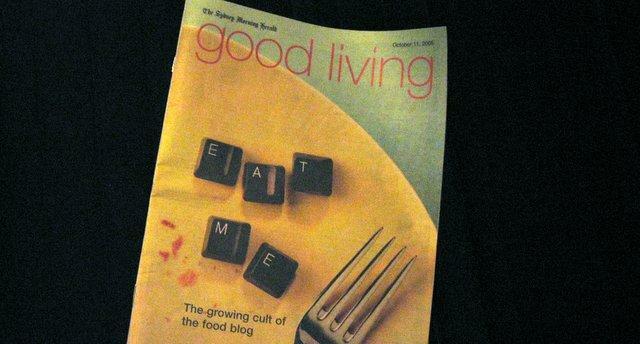 The Sydney Morning Herald Good Living magazine (11/10/05) regurgitates an Observer article on food blogging, which is actually an article about chezpim, and not much else. But they redeem themselves (partly) with a side-bar on Australian food and wine blogs, and yours truly cracks a mention. BB's first taste of mainstream media fame. Whoopee. Pity the hacks at The Age snubbed me in this week's copy-cat article in Epicure. Maybe they're worried about undermining their food guide monopoly. Eat me. On a nice quiet stretch of Vic Ave, a few doors along from Pets and the City, is Kamel, 19 Victoria Avenue, Albert Park, Tel +61 3 9696 1386. So, having stocked up on Pippin's favorite pork knots and bully sticks (hours of chewing entertainment), we dropped in for a late (and enjoyable) brekky. 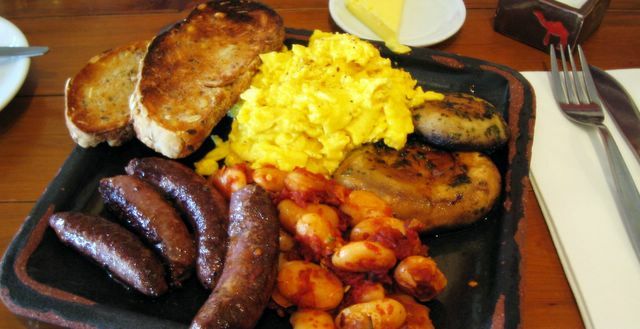 I was very happy with my scrambled eggs, mushrooms, beans and bangers. The four little Lebanese sausages (made from lamb with a hint of cinnamon) were particulary good. The baked butter beans and herb-roasted mushrooms were also very good, as was the ever-reliable Phillipa's honey-whole-wheat toast. The weakest link was probably the scrambles, which I would simply rate as good. It all came on a very cool square, battered-looking earthenware plate, which was a nice touch. They even had matching salt dishes with little red camels on them. The salmon eggs benedict was a bit of a disappointment, mostly due to hard-poached eggs and skimpy layer of hollandaise. But at least it was real hollandaise. The menu had most of what you'd hope to find at a good breakfast venue, including toast, fruit, muesli, porridge, omelettes, pancakes and toast. Some of the more interesting items were Ethiopian spice and honey toast; butterbeans with feta and Turkish bread; and egg, bacon and cheese jaffles. The venue is small but comfortable, with front windows that open onto the street, and a few outside tables for dog-walkers, etc. The coffee (Genovese), service and value were all pretty good, although I did find the staff a but surly on a previous visit. Aaah, yes... jammed in like sardines for hours on end... DVT starting to kick in... and it's time for my last Qantas brekky of this trip. No choice this time, unless you count "tea or coffee?" as a choice. Just a "continental breakfast", the highlight of which is a "mixed fruit Danish Twist"... perhaps in honour of Princess Mary? That's what I call royal treatment. The scrambles, bacon, mushrooms and sausage were also good, but it was the condiments that stole the show. HP sauce, of course. Ketchup. Colman's hot English mustard from Norwich. French's "classic yellow" mustard if you prefer the mild stuff in the ezy-squeeze bottle. Sarson's malt vinegar. And salad cream. All there on your table, ready to go. Magnificent. Presumably the salad cream and vinegar are there for those who order the grilled minute steak with two fried eggs, or maybe the ham & two eggs, both of which come with chips. You could even slurp a bit of salad cream into your Bacon Butty, if that floats your boat. The menu has something for everyone, ranging from the simple (if confusing) option of "dry slice, wet slice, fried slice or toast" (one quid) to the gut-popping option of big breakfast number 3... bacon, eggs, beans, sausage, mushrooms, black pudding, tomatoes, bubble & toast. Although most dishes looked excellent, the eggs benedict fell down on two key points: the muffins were under-toasted; and the hollandaise had no zing. As a venue, Smith's has all the buzz you could wish for, with plenty of tables in the large cafe downstairs, and a comfy bar and lounge area while you're waiting. There's also a swish restaurant upstairs, but I never got that far. 16/20 "mmm... corned beef hash"
London has two River Cafes. One is famous, was designed by Richard Rogers, and has its own line of designer cook books. The other is not (yet) famous, was designed by nobody to speak of, and will probably think you're a nutter if you ask for a cook book. I went to the latter... right next to Putney Bridge tube stop, 1A Station Approach, Tel +44 20 7736 6296. As fry-ups go, I was very happy with the River Cafe experience. The scrambles were light, and everything else was well and truly fried. The place has a classic "caff" feel, with formica tables, red or brown sauce bottles on each table, and service that's both relaxed and welcoming. Adding to the Saturday morning atmosphere were a couple of tables of Chelsea fans fueling up before the game. When you're finished, take a stroll along the river bank beside Bishop's Park, location of the scene where Father Brennan gets speared by the church spire in the 70s devil-movie classic, The Omen. The full English at Corney & Barrow, tucked under Lloyd's of London, One Leadenhall Place, EC3, Tel +44 20 7621 9201. 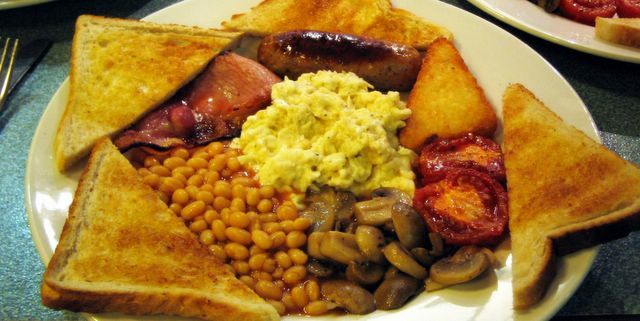 I'll have scrambled eggs, bacon, beans, sausage, mushrooms, hash brown... and a 40% line on that North American property slip. Soft market or hard, Corney & Barrow has everything you need for a busy day at the boxes. Maybe a couple of soft-boiled eggs with soldiers? 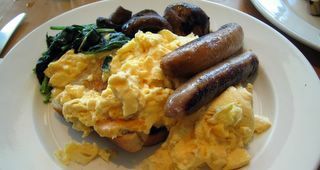 Or grab a cumberland sausage and egg toasted sandwich and run. It's all good, basic, brekky fuel... without ever leaving the building. At first I thought we'd walked into Pram-World by mistake... "Here we have the Peg Perego Venezia, ideal for city driving... or, for some off-road action, strap bubby into the Phil & Ted Adventure Buggy 3 Wheel Jogger..." But after the initial confusion wore off, I was relieved to discover that this was indeed lb.2 (as in "pound 2"), 1-3 Carre Street, Elsternwick, Tel +61 3 9528 6440. Feeding time. Restaurants really should take care with their use of puff & fluff. Those gratuitous adjectives that pepper the modern menu might sound cool when you dream them up, but they have a critical impact on dining expectations. This morning, for example, I was tossing up between poached and scrambled. So when I read "fluffy scrambled eggs" on the menu, I'm thinking... "mmm... fluffy scrambles... that sounds good". Problem was, the scrambles were anything but fluffy, which made for double the disappointment when the scrambled egg pancake actually arrived. It's all about expectations. If you're gonna lure people in with "fluffy" eggs, you better make sure the scrambles are floating of the plate. Having said all that, my serve of Lb Eggs #2 was otherwise quite good. 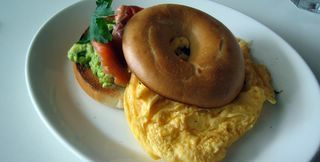 The scrambled eggs were OK (albeit not fluffy), and the flavours of the avocado mash, smoked salmon and toasted bagel combined very well. Lb Eggs #1, was more disappointment, with an under-toasted bagel covered with melted cheese, tomato and a slice of processed ham, all topped with poached eggs. On a positive note, most of the sweet/healthy stuff looked very impressive. Fresh, chunky fruit salad with toasted almonds. Smooth porridge with a choice of fruit compote or fresh strawberries and banana (a nice contrast). Berry bomba or Bircher muesli with organic yoghurt. They also did an interesting, chunky version of baked beans. The venue is modern, well designed, concrete-timber-and-glass cafe, with a mix of high bars, low bars, banquettes & tables. It also has parking for about half a dozen prams. And coffee, service and value are all good. It's a nice spot, on the edge of the bay with views across the water. The service and coffee were both very good. But there were too many weak links with the food for this place to score high marks, let alone win an award. My scrambled eggs and sausages were fine, but the mushrooms were large, leathery old fellas that really should have been peeled. The spinach was equally long in the tooth, with stringy stems and a few bonus strands of twine. At first we thought it was hair, but on closer inspection it became clear that some of the packaging material had slipped past quality control. Oops. The other disappointment was the hollandaise on the salmon eggs benedict. If it was freshly made (which I doubt), then they had done an excellent job of mimicking the over-creamy pale stuff that comes from a bottle. It's also expensive. $18 for the "Girlz Breakie" of scrambled eggs, avocado, smoked salmon and toast. They even charged me 50 cents for some HP sauce.